Every year the United Nations Food and Agriculture Organization (FAO), celebrates an awareness of Soil. December 5th, 2018, At the World Permaculture Association, we joined in the celebration of awareness for World Soil Day (WSD). This years theme is Stop Soil Pollution Be The Solution. #StopSoilPollution is at the heart of the Global Soil Partnership’s mandate as demonstrated by the Global Symposium on Soil Pollution. We work to ensure that people have safe and nutritious food to ensure active and healthy life without endangering essential ecosystems services (1). In 2016 this day was officially recognized in memory and with respect for this beloved monarch who passed away in October 2016 after seven decades as head of state (1). If you go to the FAO site, you can see each theme of World Soil Day (WSD) World Soil Day since 2012. The World Permaculture Association and I want to celebrate and push forward with ways we can be the solution every day not just on one day a year. This article has five solutions that are at the top of my list of ways to the solution. The very first step in the mission of being the solution to soil pollution is understanding what soil pollution is. Soil Pollution is the presence of toxic chemicals that penetrate the earth which causes destruction or degradation to the soil, water, ecosystems and, habitats. Next Step is to remove all chemicals. Chemicals are not the solution; you can take the pledge of no more chemical usage for example insecticides, fungicides or, herbicides. In many cases even natural pesticides like copper pollute, the soil bringing the toxicity for microorganisms and water. The effects of chemicals on the soil are multi-leveled. Degradation of the soil and the Community of Organisms in the soil is the first level of harmful interaction in the soil. All of these harmful effects cause further destruction and degradation. Three big reasons composting is the solution to soil pollution. Compost helps retain the moisture suppressing plant diseases and pests naturally without chemical usage (2). Encourages the production of beneficial bacteria and fungi that break down organic matter to create humus, a rich nutrient-filled material (2). Composting will reduce methane emissions from landfills and lowers your carbon footprint (2). If you already have read my article on Vermicomposting, you will see worm farms go together with composting. Vermiculture is the process of using worms to decompose organic food waste, turning the waste into a nutrient-rich material capable of supplying nutrients to help sustain plant growth. A worm farm saves water, energy, landfills, and helps rebuild degraded soil. The additional benefits from a worm farm are the worms. Worms dig holes into the soil allowing rainwater to reach deeper and closer to the plants’ roots allowing for extra absorption of the rain. Allowing an increase in the soil’s water capacity. The Worm Castings (also called Vermicast, worm humus, worm manure, or worm feces) is the end-product of the breakdown of organic matter by earthworms. Additionally, the worm castings are highly concentrated in nutrients and beneficial microorganisms. The Worm”Juice” is what I personally call the liquid I collect from the vermicomposting bins. I then collect ‘juice’ from vermicompost, dilute the collected microorganism solution with water. Spread the solution throughout the plants and the soil as a chemical-free fertilizer. Effective Microorganisms (EM) are mixed cultures of beneficial naturally-occurring organisms that can be applied as inoculants to increase the microbial diversity of the soil ecosystem. The diversity of microorganisms contained in EM and the metabolites they produce will increase the number and diversity of microorganisms in the soil. When microorganisms are activated, protozoans and larger organisms such as worms will increase in number and a healthier ecosystem will result (3). Deforestation affects many different areas of our ecosystem. 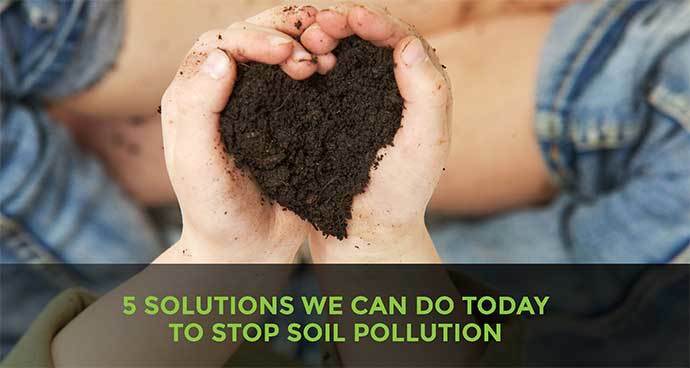 Today let’s focus on soil pollution. Planting a Tree is a solution because it helps prevent soil erosion. Trees and plants create a relationship with microorganisms and Mycorrhizae that feed the soil and increase tremendously the nutrient absorption surface for plants; they also produce biomass that is transformed into humus and make water available through different processes like water condensation from the air. I mentioned five solutions to soil pollution. However, there are many different ways to make a dent in the amount of soil pollution filling up our common garden. The important part is standing up, take a pledge, spread the word or join a Permaculture Design Course.